Hamas official tasked with int'l relations says terror group wants seaport, is studying ceasefire document submitted by Tony Blair. After Hamas and Israeli sources both confirmed indirect talks being held to reach a long-term ceasefire deal on Tuesday, a senior Hamas source revealed that a document of ceasefire ideas, drafted by former UK Prime Minister Tony Blair, had been received. Blair served in the past as the Quartet envoy to the Middle East. The source, Osama Hamdan, is responsible for the international relations of the Hamas terrorist organization. He told the Hamas paper Palestine on Tuesday that the organization's leadership is currently debating the ideas outlined in the document, and that Hamas is demanding clear guarantees from Israel that it will implement the ceasefire sealed last August 26 after Operation Protective Edge. 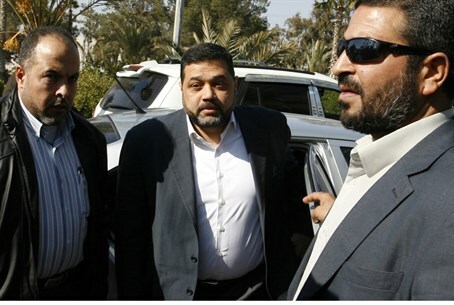 Hamdan rejected the notion that Hamas is ready for a ten-year ceasefire, and generally ruled out a long-term ceasefire. However, the group is ready for a agreement on "quiet" in return for a removal of the Israeli "blockade" of Gaza, he said, indicating the group's desire to continue covertly rebuilding its depleted weapons stockpiles. The "blockade" is partial at best, seeing as hundreds of trucks carry goods into Gaza every day, despite the security checks. Hamdan stated that the terrorist organization reserves the right to "respond" at the time and manner of their choosing to any Israeli breach of the agreement. Western states are aware that the situation in Gaza is liable to spin out of control and are therefore interested in a solution, he said, noting how the West is pressing for a ceasefire agreement. Hamdan also emphasized that Hamas demands that an agreement include the opening of all border crossings to Gaza, as well as an opening of the Gaza port which Israel has warned would allow an unchecked influx of weapons to the terror group. Hamas has already been busily siphoning off construction materials to rebuild its terrorist attack tunnels into Israel, and has likewise been developing its domestic missile program to prepare for its next attack on the Jewish state.